What is it about The Halal Guys that diners love so much? Well, first it’s the food. The Halal Guys food cart, with the tagline “we are different,” has over 8,000 reviews on Yelp. 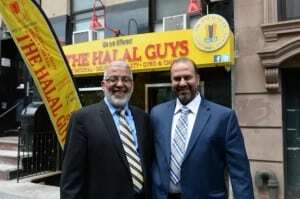 The Halal Guys, the innovative American Halal food concept based in New York City, has announced the signing of a 5-unit franchise deal for territories in Toronto. NYC’s Famous The Halal Guys Sign Development Deal For D.C. The new franchisee, who worked with Fransmart East Coast Sales VP, Ryan Durishin, has signed on to develop 10 units, representing the entirety of the total D.C. market available. ‘Halal Guys of New York’ has five days to ‘dispose of any signs, banners, promotional or advertising items’ that look like the original Halal Guys signage. The eatery, a 20-seat joint on 14th St. in the East Village, will serve a prettified version of the Middle Eastern street food that draws lines down the block in Midtown.